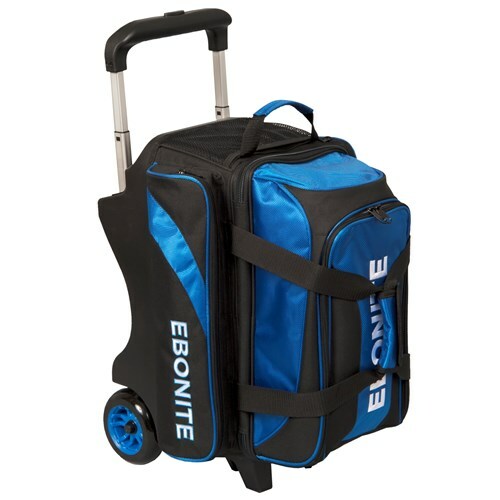 The Ebonite Equinox Double Roller bowling bag is a premium quality bag that holds up to 2 bowling balls, shoes up to a men's size 15, and accessories. 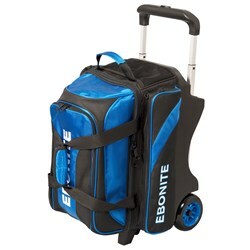 The deluxe features of this bag include color coordinated wheels for style and large accessory pockets on both sides for convenience. You won't want to miss this great bowling bag! Wheels: Color coordinated 5" Smooth KRuze urethane wheels with steel bearings for a quiet and smooth ride. Large accessory pockets on both sides. Separate shoe compartment holds up to size 15 shoes. Retractable flush square locking handle extends to 39"
Good bag but the handle is faulty. Worked fine for the first few month but then the handle started to stick and wouldn't collapse back into the bag unless we giggle it for 30-40 seconds. Completely annoying! Due to the time it takes to produce the Ebonite Equinox Double Roller Black/Royal ball it will ship in immediately. We cannot ship this ball outside the United States.